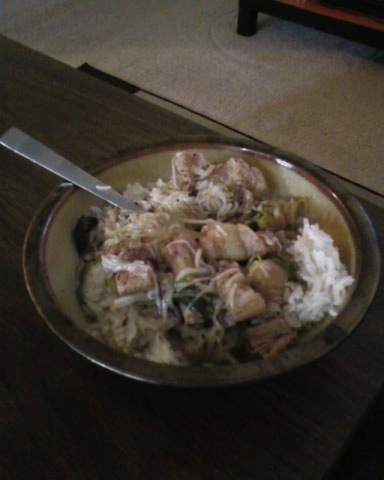 i really should write more about the filipino food that i cook. in the meantime, boil the pork in a separate pot until cooked. keep the broth. add the pork broth and let simmer. take 3 teaspoons of the pork blood and add it in. 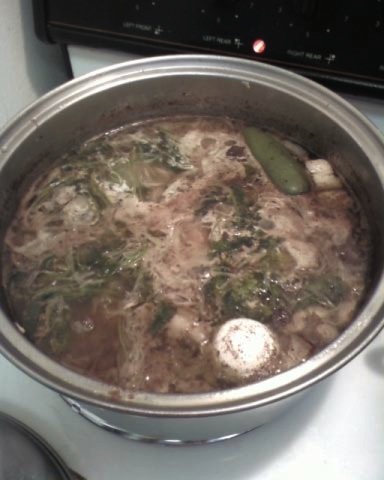 it will solidify in the batchoy. deathly hallows trailer released now! 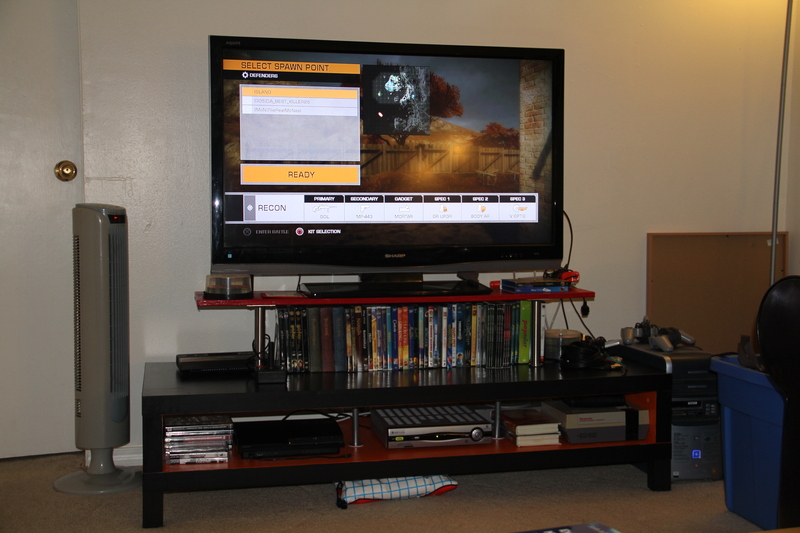 so… we got a new tv and we needed an acceptable tv unit for it. at first we had resolved to custom build our own until i had the brilliant idea to look at ikea hacker. it was too bad because boyfriend and i spent an entire friday evening planning and sketching our tv unit (me on my sketchbook and him on google sketchup). after looking at some of the ikea hacks, i browsed around craigslist and ikea to find suitable pieces for us to use. we eventually settled with the lack tv unit. First, we sanded what would be the interior portions of the unit with 400 and 200 grain sandpaper. We then primed and painted it using glidden’s high gloss paint in tangerine. We also made use of the unfinished ekby shelf and sanded lightly then painted using glidden’s high gloss paint in candy apple. once dried, we assembled the tv unit. we then attached capita legs to our now red ekby shelf. 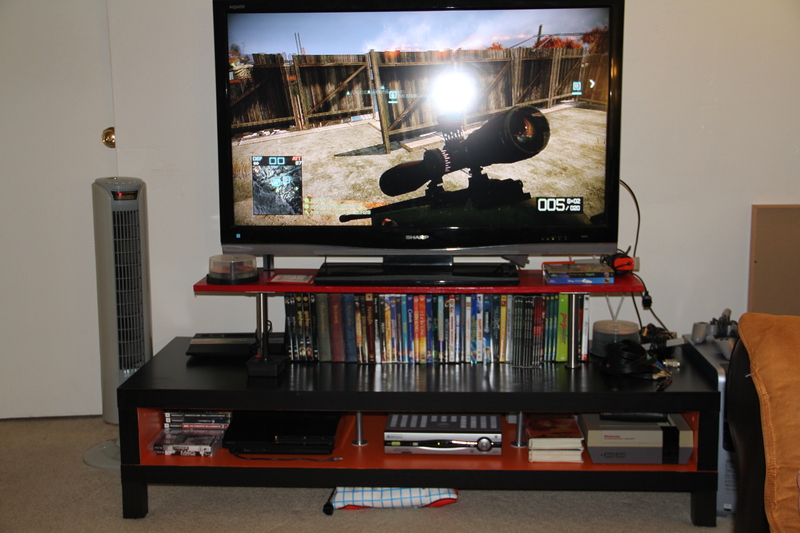 the finished product had the original lack tv unit with our modified shelf placed on top of it. filipino colonial mentality is a fabrication? pfft! today, i discovered a website that has a collection of historical notes, essays and commentaries on the philippines. i was immediately excited to find this thinking that i can further my self-education into my heritage and find some sort of connection with like-minded filipinos. this quickly turned out to be a disappointment after reading my first two essays–one regarding the pidgin language of chavacano and the other discussing colonial mentality in the philippines. the first article, i simply posted on my facebook with a comment stating my distaste for its stance. the next article got under my skin more than i thought it did. as i started typing my comment, it quickly became apparent that this was going to be much longer than a few lines. so rather than clicking the submit button, i will post my response on my blog. i wholeheartedly disagree with this essay. you’re actually trying to make a comparison between swiss watches/french perfumes and philippine exports? when someone points out that they have a swiss watch, it is because the swiss have a longstanding reputation of quality watchmaking. The same goes for the other examples you cited in their respected industries. that is hardly the same thing as going to my nearest arts and crafts store and seeing the paper mache products from the philippines. the philippines don’t have a reputation for any of the aforementioned products in this article. it’s likely that other countries get these items from the philippines because of the lower costs rather than craftsmanship or expertise. why is it that when a filipino has an item, the first thing they boast is “imported ito”? and when you say that filipinos watch local movies and adore local stars, you’re forgetting to point the fact that many of the filipino “actors”, if you can even call them that, are of mixed ancestry, foreign-born or both. the filipino entertainment industry hardly consists of quality filmmaking. furthermore, as a PROUD filipino with kayumanggi complexion, it is very rare for me to watch filipino entertainment and see myself looking back at me. i see white complected or bleached out skin uttering some half-hearted tagalog. and to that point, as a proud filipino, i make a point not to code-switch, keeping my english and tagalog separate when speaking. just as the french have the académie française to regulate the amount of influence foreign tongues have on the french language, perhaps the philippines should implement a similar system before the unique and native languages of the philippines become extinct. don’t delude yourself, mr. royeca. as a people, we’re still suffering from the crimes of cultural brainwashing that were committed against us. and to perpetuate an idea that implies otherwise is simply sweeping our shame under the rug and passing on the abuse to filipinos of the next generation. that is what’s anti-filipino. do i want this person to know about my life? does this person care to know about my life? is facebook the only way to keep in contact with this person? being able to answer no to one of these questions for each person made it easier for me to whittle down my friends list. another reason to be more selective with my facebook friends is that keeping facebook friendships intact can be socially exhausting. if for some reason, you ignore a friend request it must be because you have something against that person. somehow, facebook became the ruler with which we measure the quality of our relationships with other people. it’s annoying. i remember having a 100 friend limit for my facebook and would go through my list at the end of each semester to delete people i’d probably never speak to again. i doubt i can get back to my 100 person rule but i can keep it down to a minimum. i’m still in the process of defriending so if you find yourself having one less friend on facebook, calm the eff down–i don’t hate you. in fact, it may just be because i’d prefer to see you in person and don’t want to use facebook as a crutch. ok maybe not, but still. as far as the video above, the person who commented on my last post should really have followed rule #8. i guess he didn’t know about ip addresses.